West Bengal Gram Panchayat Election Results 2018: Mamata Banerjee-led Trinamool Congress raced towards another big win on Thursday, after establishing an early lead. TMC workers broke into celebration as results started trickling in, pointing towards victory. The party has won four zilla parishads and is currently leading in 16 seats. As counting began on Thursday morning at 291 counting centres, sporadic reports of violence also emerging from few places. Opposition created a ruckus after accusing the ruling TMC of setting up their own party agents as counting officers. Trinamool has denied all allegations. The chief parties in the fray for WB rural polls are Mamata Banerjee-led Trinamool Congress, the Bharatiya Janata Party and the Communist Party of India (Marxist). The polls were marked with violence. At 12 persons died and over 40 injured after 43 clashes ensued between cadres of the contesting parties. Reports of miscreants stopping the voters from exercising their franchise, booth capturing and destroying ballot boxes emerged from several districts. The voting took place for 621 zilla parishads, over six thousand panchayat samitis, and nearly 31 thousand gram panchayats. The zilla parishads are Bankura, Burdwan, Birbhum, Darjeeling, Howrah, Hooghly, Jalpaiguri, Cooch Behar, Malda, Paschim Medinipur, Purba Medinipur, Murshidabad, Nadia, Purulia, North 24-Parganas, South 24-Parganas, Dakshin Dinajpur, Uttar Dinajpur, Siliguri MP, Kolkata-North, Alipurduar, Kolkata-South and Paschim Burdwan. Following the violent clashes, the State Election Commission ordered repolling in 572 booths. The voting was held on May 14, repolling on Wednesday, May 16. Over 73 per cent of the electorate had turned out to cast their vote, while 68 per cent voter turnout was recorded in the repolls. The SEC had initially earmarked 568 booths for repolls but later increased it to 572 booths. Criticism emerged from several sections following the widespread violence that ensued in the state rural panchayats. Prime Minister Narendra Modi on Tuesday called it murder of democracy. “The scenes from the Panchayat Elections in West Bengal. It was nothing but a murder of democracy. From the nomination stage to the day of polling, where was the spirit of democracy? People were bullied," said the PM. Ruling Trinamool Congress has dismissed all allegations of violence as baseless. The panchayat elections in West Bengal saw huge-scale clashes on Monday, primarily between TMC workers and the BJP and CPM. Mamata has hit back at PM Modi who had accused the WB government of inciting violence. "BJP workers did not lose lies in the violence. Trinamool workers did. The PM of the country does not obey his words, he forgets his constitutional position and is making comments on the state's law and order," she said. TMC has emerged victorious in 90% of seats despite the Opposition parties coming together. This shows how strong we are at the grassroot level, says West Bengal CM Mamata Banerjee. Mamata Banerjee claims TMC has won in 90% seats. "This shows how strong we are at the grassroot level." Reports of crude bombs being hurled coming in from Majiara. Police resort to tear gas shelling after miscreants surround the vehicle of the Sector Officer here. Trends show Trinamool Congress is trailing in Purulia district. The latest update is as follows - In Zilla Parishad, the TMC has won 351 seats, BJP 9, Left 2, Congress 4 and Others 0. In Panchayat Samiti, the TMC has won 3541 seats, BJP 281, Left 100, Congress 62 and Others 1. In Gram Panchayat, the TMC has won 18715 seats, BJP 4656, Left 1378, Congress 801 and Others 1601. Election Commission orders re-polling at part number 79/80 of Fulbari-1 in Jalpaiguri district. Counting agent of BJP candidate Doli Sutradhar had alleged that he was attacked by TMC supporters who also looted ballot papers at the counting room, as per ANI. BJP wins five gram panchayats in Bankura - Puddi, Sarenga Bikrampur, Kenjakura, Simlapal Bikrampur and Mankanali. According to the SEC, the TMC has won 2,467 gram panchayat seats and is leading in 2,683 seats. The BJP has won 386 seats and is leading in 231 seats while the CPI(M) won 94 seats and is leading in 163 seats, the officials said. The Congress won 33 seats and is leading in 55 seats. Independent candidates have emerged winners in 158 seats and are leading in 163 seats. TMC surged ahead by registering victory in over 2,400 gram panchayat seats, according to the results available till 12 noon, SEC officials said. The BJP and the CPI(M) won 386 and 94 gram panchayat seats respectively, the State Election Commission officials said. In a major development, jailed candidate Arambul Islam has won from Bhangar's constituency number 2. His son Hakibul also won another constituency in Bhangar. At Dakshin Dinajpur's Harirampur counting centre, clashes broke out between Congress and TMC members. In Ethora gram panchayat, TMC won three seats while BJP secure two. In Eastern Burdwan's Memari, Opposition claimed that their cadre was beaten up and expelled from a counting centre by ruling TMC. In Baruipur, protestors forcibly try to break barricades and enter counting centre. Police, present at spot, baton charge. In Rajarhat's Chandipur, Opposition accused the ruling TMC of setting up their own agent as the counting officer. Trinamool has denied the allegations. BPJ accuses of not providing counting agents in North 24 Parganas' Amdaanga. Similarly in South 24 Pargana, a war of words ensued after Opposition claimed counting agent was not provided at the counting centre. Trinamool has already secured 16814 gram panchayat seats unopposed. Unidentified miscreants ran away with ballot boxes from a polling booth in Malda district on Wednesday morning, as repolling was underway in 568 booths across West Bengal. Reports of violence also emerged from some parts, with Rapid Action Force (RAF) and police baton charging on the crow. 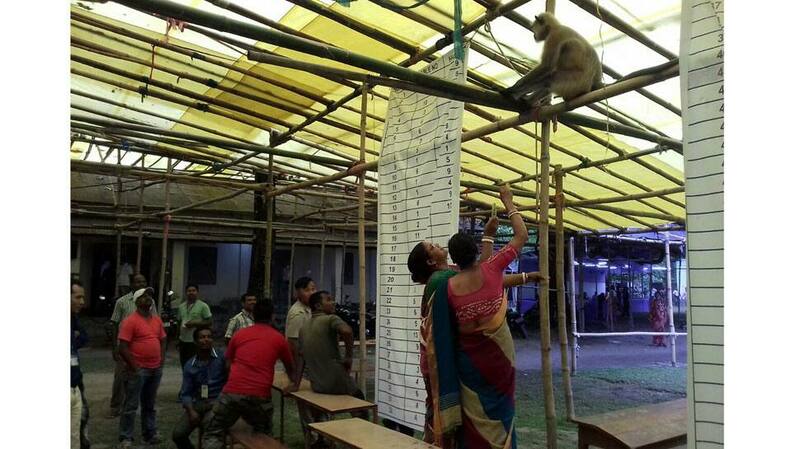 A hilarious scene ensued after a monkey entered one of the counting stations. Reports of violence are emerging from the Uttar Dinajpur, before counting began. The bullets were shot, bombs hurled. A Congress leader's car was vandalised. Opposition has reached police station to complain about this. The SEC has emphasised to finish counting within two to three rounds. In 2013, the counting for WB gram panchayats continued passed the midnight. In some places, the results were declared the next day. No one is allowed to carry mobile phones inside the counting centers. The phones will be stored outside the centres. However, some polling officers have been allowed to carry it inside. There are a total of 291 counting centers. Each counting centre to have a three-tiered security system, with armed security personnel guards. Section 144 has been implemented within 200 meters of the counting center. Statistics reveal that of the total 58,692 seats in the three tiers of the rural local bodies, 20,076 seats, or 34.2 percent, have already been decided uncontested, with the Trinamool Congress bagging a whopping proportion of these seats, as per IANS. These include 16,814 of the total 48,650 gram panchayats seats, 3,059 of the 9,217 panchayat samiti seats and 203 of the 825 zila parishad seats. The Supreme Court has now asked the SEC not to issue winning certificates in these seats.